Have you met my friend S.Tirfry? 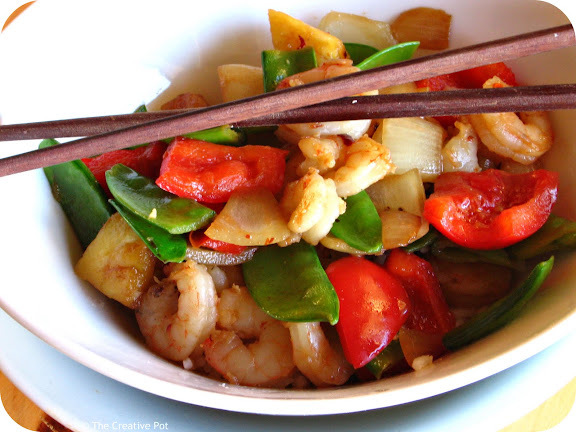 S is a very versatile lady - you can dress her up or down, make her asian, spicy, vegetarian or fishy. Best of all, once all the chopping is done, you can whip up a nutritious meal in a matter of mere minutes. S is a clever lady indeed! Now I've made quite a few chicken stirfries and beef stirfries and even vegetable-only stirfries, but never tried my hand at a seafood stirfry. Truth be told, I'm a little bit scared of seafood. I assume it's because we didn't grow up eating a lot of seafood, so whenever I'm confronted with a whole fish in the supermarket, I swiftly turn the other way. I've tried being brave - using crabmeat in a pita for example, or making a spicy calamari stew (not blogged, but delicious! ), I've even bbq'ed some prawn skewers. But to add it to something I already know and love? That seemed a bit risky. What if it completely screwed up the taste of the stirfry? Turned it into a big pot of yuck? The opportunities for disaster seemed endless. But, my logical side reasoned - what if it turned out tremendously tasty? And you missed out on the awesome flavour because you were a scaredy-cat? That would be tragic. And so, without further hesitation (okay there was a little bit of hesitation) I plunged ahead and came up with this: Sweet & Sour Prawn Stirfry. Was it good? Hell yeah. Would I make it again? Come on look at that photo again - do you even need to ask? Seafood-cautious hubby also gobbled it up which is testament to it's success. The sweet and sour sauce with just a bit of chilli complemented the prawns perfectly, as did the pineapple. 1. Defrost prawns under cold running water in a colander. Let rest while continuing with the rest of the stirfry. 2. Heat 1/2 tablespoon oil in a wok over high heat, add the onions and fry for 2 - 3 minutes, then add the bellpepper. Stir fry for 3 - 4 minutes, then add the mangetout and fry another minute. Remove from wok and set aside. 3. Using half the remaining oil, add the prawns to the wok and stir fry over high heat for a few minutes until cooked through. Prawns should be light pink and start to brown a little bit on the undersides. Remove from the wok and set aside. 4. Add the remaining oil to the wok, heat again over medium heat, then add the ginger, garlic, honey, soy sauce, lemon juice and chilli flakes. Cook for a few minutes or until the sauce thickens slightly. Add back the vegetables and prawns and cook, stirring for a minute or so until evenly coated. Serve immediately with freshly steamed rice. Damn! Leave the pots and start doing photography! I wanted to see how you're doing after my tips. I'm amazed! I can definitely see an improvement in the photos! They look amazing. And this dish - awesome. I love the way you started out this post. Gave me a good laugh. Stir fries are the best! The photos look great and so does the stir fry! Excuse me, but I'm still greedy-staring at the picture. That is my official comment.